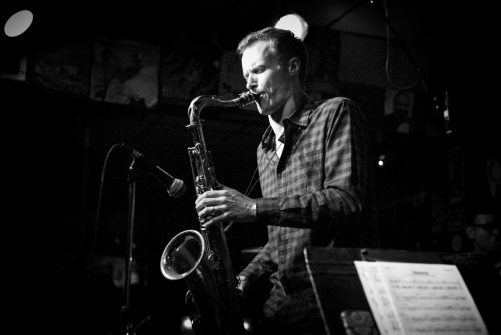 Bob Reynolds is an American jazz tenor saxophonist and Grammy Award-winning member of the band Snarky Puppy. Widely known for his work with both Snarky and John Mayer, he is a prolific composer and recording artist with eight top-selling solo albums to his credit. The New York Times called him “a self-assured saxophonist and an unassuming yet effective composer.” An independent recording artist, Bob’s albums showcase his melodic improvisational style, tuneful songwriting, and, as the LA Times put it: “hip-swiveling” grooves. Bob’s 2013 album ‘Somewhere In Between’, a seamless blend of jazz, blues, rock and pop, reached #1 on iTunes’ jazz charts. In 2017 he released the albums Guitar Band and Hindsight and released Quartet in 2018. Born in Morristown, New Jersey in 1977, Reynolds grew up in Jacksonville, Florida, where he first started playing saxophone at age 13. Although he listened to a range of music as a kid, by his late teens he was a dedicated jazz student. After high school he honed his skills at Boston’s Berklee College of Music, where he mentored with George Garzone, Hal Crook, and others. Bob is a passionate educator and in-demand clinician. He co-founded an annual retreat for saxophonists and, through his Virtual Studio, he helps musicians become confident improvisers. Bob lives in Los Angeles and shares insights on balancing a music career with raising a family through his popular YouTube vlog. This is an unreserved mixed seated and standing show.